Today AMD is announcing their “new” HD 7990 dual GPU graphics card. 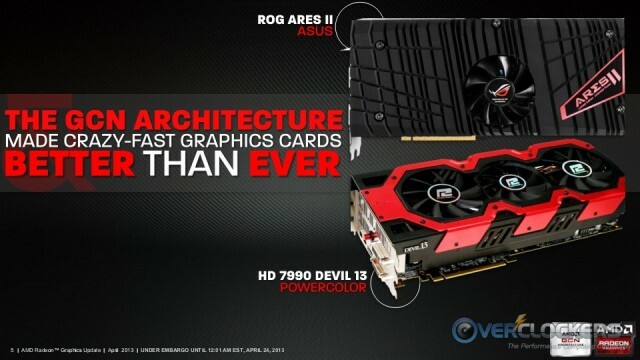 This isn’t very new though, as there have been two cards with dual HD 7970’s on them for a while now. 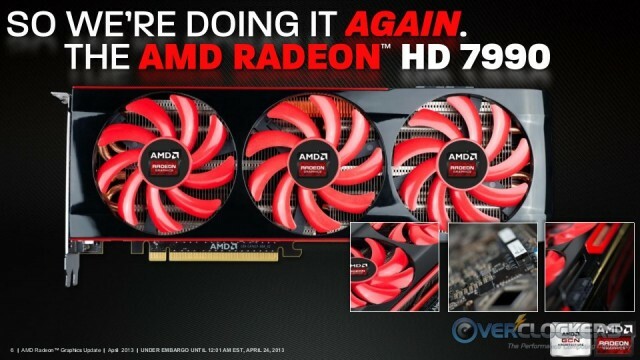 Rumored for a long time, AMD is finally bringing the reference HD 7990 to the market. 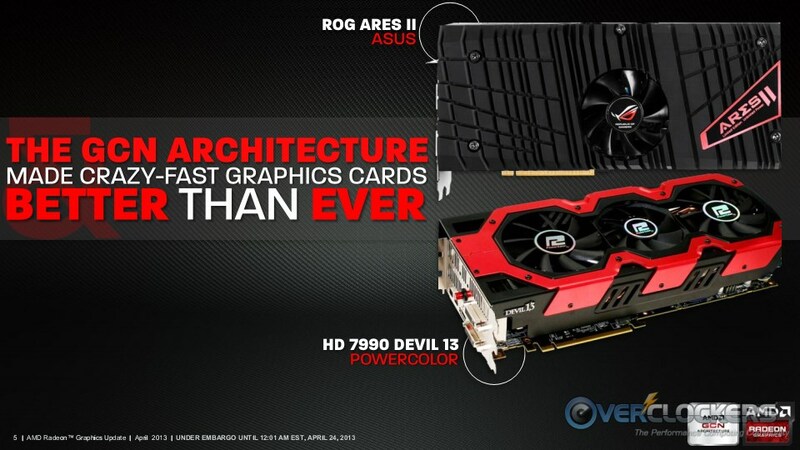 The first two that made it to market, with the AIB partners working extensively with AMD, were the ASUS ARES II (which we reviewed right here; you can see NVIDIA GTX TITAN vs. the ARES II here) and the Powercolor HD 7990 Devil 13. Which leads us to the new reference card, what has to be one of the worst kept secrets in the industry. 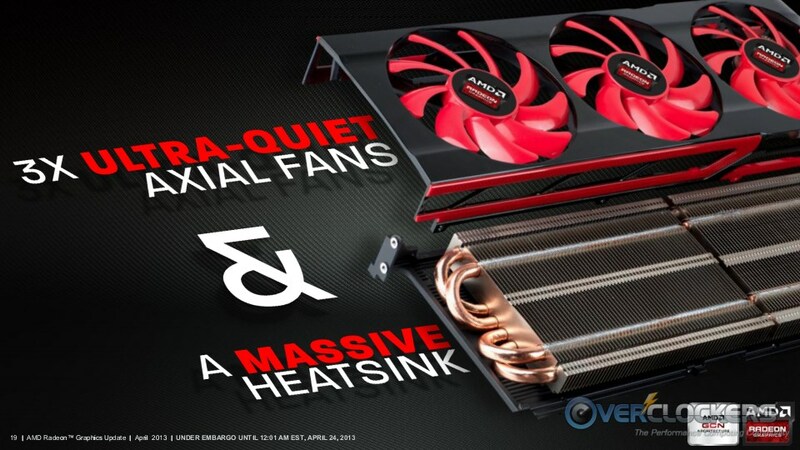 That said, I’m impressed AMD went this route on their cooler. It’s far and away a better solution than the HD 6990 and the GTX 690. 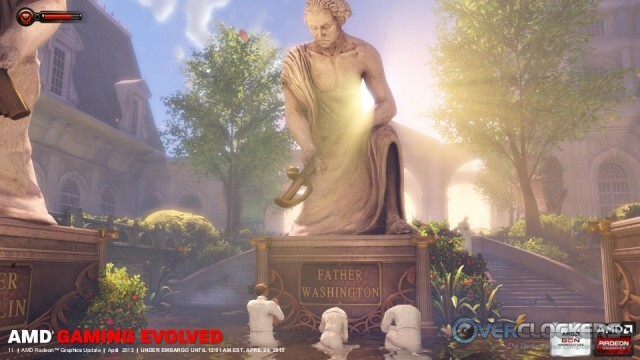 AMD made a big deal about how Gaming Evolved improves the picture. Granted, their program is doing great for their GPUs, but these slides are rather silly. 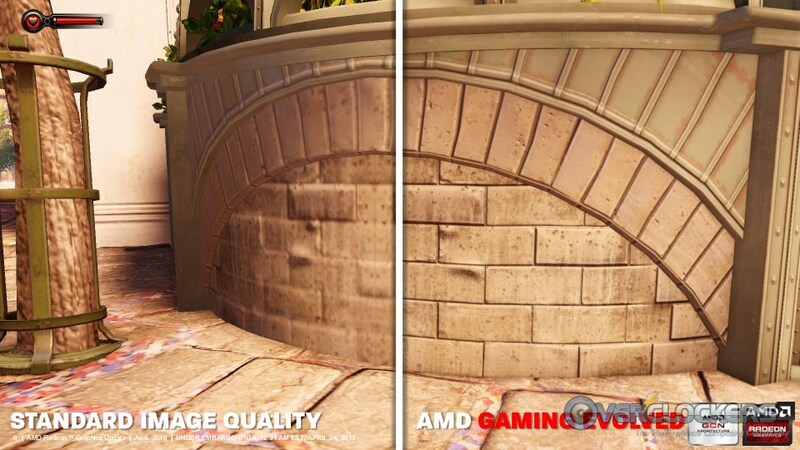 Here’s a layman’s translation of what happened in this next series of slides: AMD turned detail down to equate to what you’d see from a console (with years old hardware) and then cranked everything up to what you’ll see in a PC with a high-end GPU. So while AMD is indeed working with these game companies to help develop the technologies to make these games look good (and we’re very grateful for that), what these slides basically show you is console vs. PC, because the tech used on the cards can be used with any GPU on the market, not just AMD. Now we get to the meat of the matter. The launch of the AMD HD 7990 is, frankly, pretty “meh”. If they didn’t already exist in one form or another, it might be more exciting, but they do. Now there is just a reference board for partners to release. 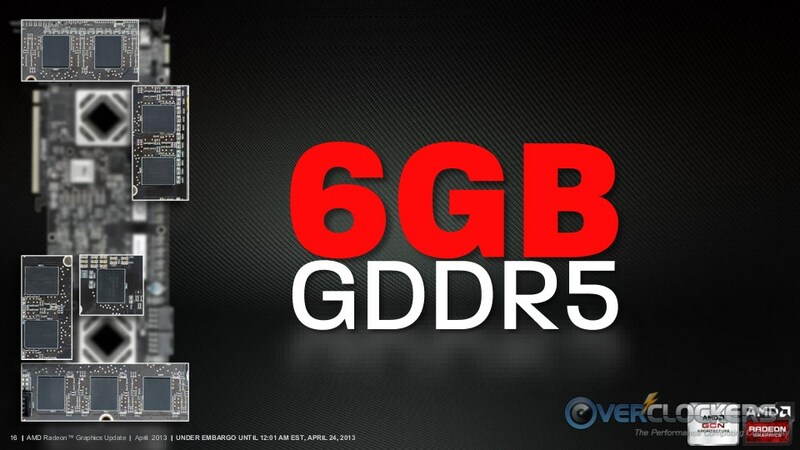 In any case, the most exciting thing AMD has going for this card is the absolutely massive bundle. It is truly staggering all the games you get if you buy an HD 7990. Assume for a moment these games average $45/each (other than the Far Cry 3 expansion), which is probably a little low. 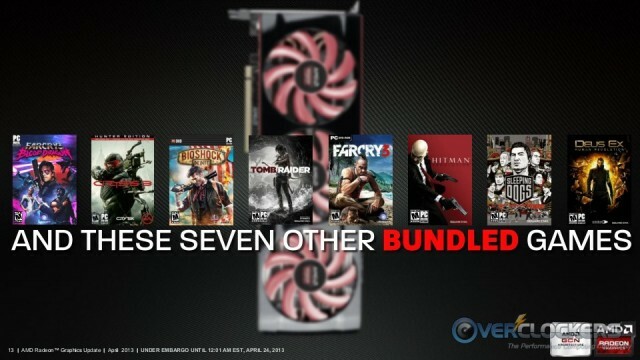 That’s $315 worth of games for free, plus the FarCry 3 Blood Dragon expansion. This is a powerful argument for purchasing a high-end AMD GPU. 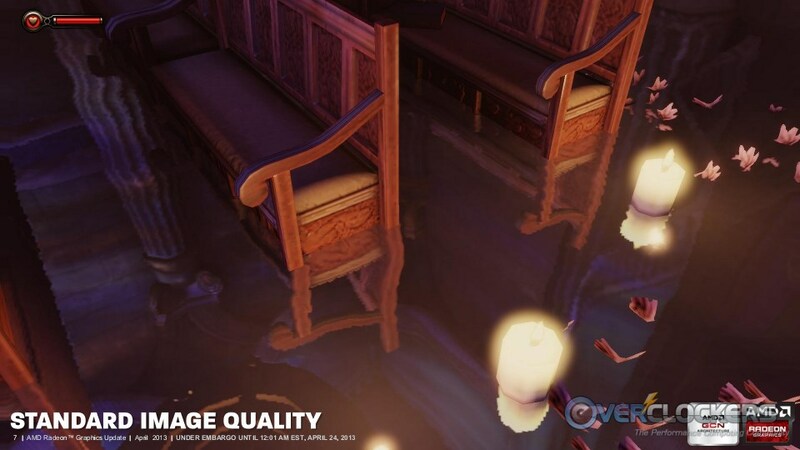 The performance is there and this might be enough to tip the scales for gamers who love to play with new games. This is also the GPU of choice for EA and DICE, who selected it to run their first public demonstration of Battelfield 4. 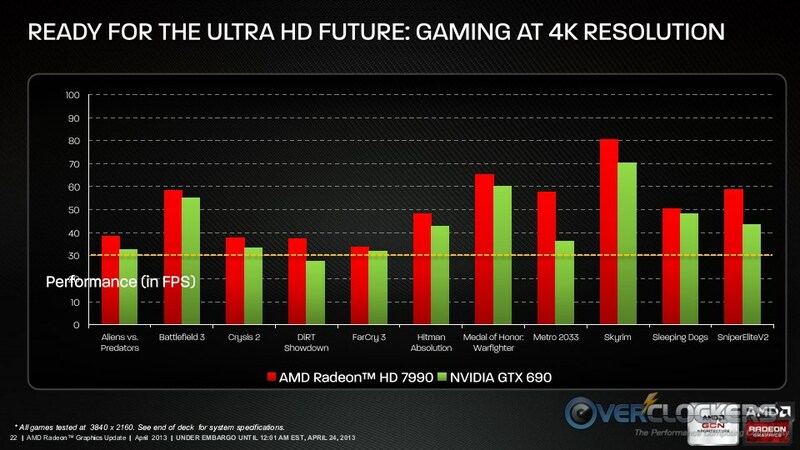 AMD also states, “this is also the only graphics card that can run Crysis 3, as well as Tomb Raider (with TressFX enabled) in UltraHD resolutions of 3840×2160.” Sounds like there is some pretty hefty horsepower under there as we would all expect. So, what do you do when you don’t really have super exciting news over what’s already out there? MAKE THE TEXT SUPER EXTRA BIG! 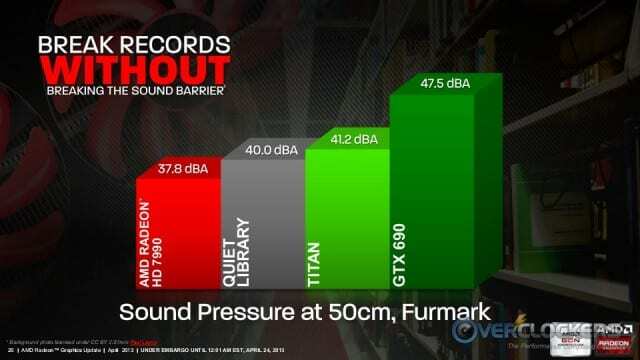 That’s not to say the dual GPU monster HD 7990 doesn’t have impressive specs, but this is a little silly. What, that wasn’t big enough? 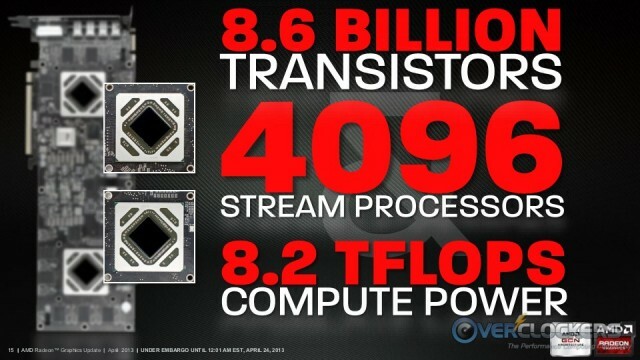 Let’s make the three GB per GPU (standard for an HD 7990) EVEN BIGGER! (But wait, there’s more!) Though this is a great value-add in itself. The HD 7990 gives you the ability to run five monitors off this single card. NVIDIA’s cards don’t even possess five outputs, so this is a solid talking point. I’ve always wondered what five monitors in portrait looks like. Three in regular Eyefininity/Surround is pretty sweet, I must say. The GPUs talk to themselves courtesy a PLX bridge. AMD is proud of this cooler and if it works as quietly as they say it does, they have every right to be. If nothing else, it is a vast improvement over the previous generations’ coolers. They are proud of its cooling ability, but even more so about its noise level…or lack thereof. On our conference call with AMD discussing this launch, they were very quick to give credit where it is due and gave good praise for the GTX TITAN, on which NVIDIA did very well in regard to cooling with silence. AMD says that gave them a target, at which they aimed and say they’ve beaten. ZeroCore is good for power efficiency. Not only can one GPU totally go to sleep in 2D operation, both can go to sleep when the PC is idle enough to turn off the monitor. Last, but not least, are AMD’s testing results vs. the GTX 690 (which is better for FPS than the TITAN) at both 4K resolution and 5760 x 1080. AMD wasn’t able to get a card to us in time to test for this release, but EarthDog has one in the works and we hope to bring the full review to you. That’s really okay though, because we’ve already reviewed one. It had a crazy improved cooler and was clocked 100 MHz higher (which should be a walk in the park for this card), but the ARES II should be close to representative of what the reference HD 7990 can do. (Check out the ARES II’s review right here and continue on to see NVIDIA GTX TITAN vs. the ARES II here). 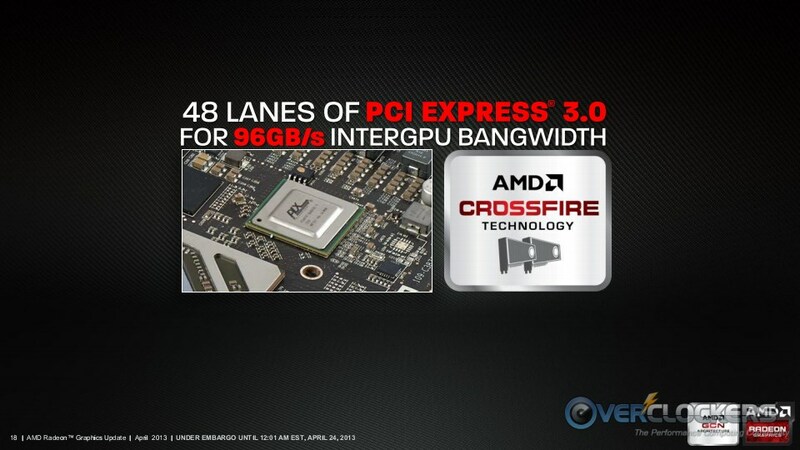 AMD has pricing set at an MSRP of $999. It will become available at eTailers within two weeks after today. So, we have a bit of a paper launch as it were, with nothing available when the NDA expires and reviews go live (today). 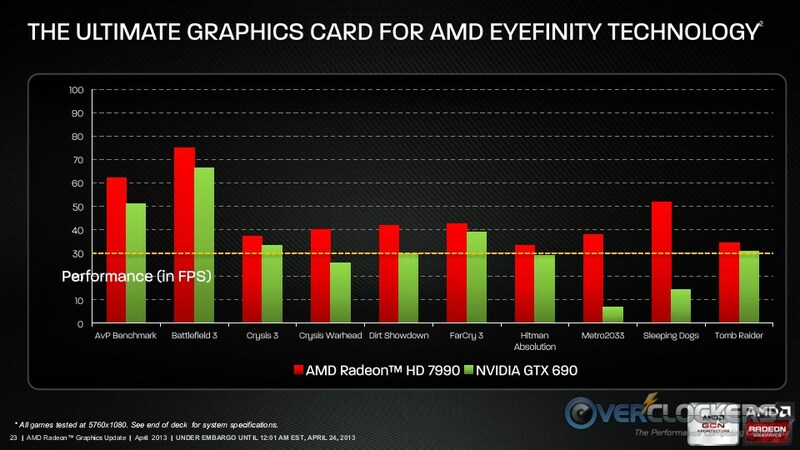 AMD says they’ve taken the title back for the world’s fastest graphics card. In straight FPS numbers that’s probably 100% accurate. However they do need to do a little driver work to get their card totally up to snuff. They are indeed working on the driver and expect it to be out “this summer”. 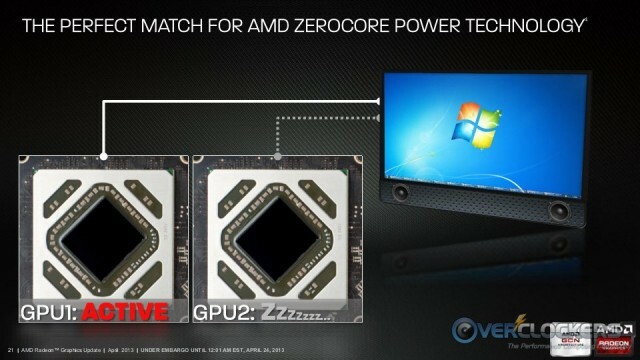 We’ve heard July tossed around for AMD to introduce frame delaying/smoothing akin to NVIDIA’s solution, but AMD won’t commit to a date just yet. 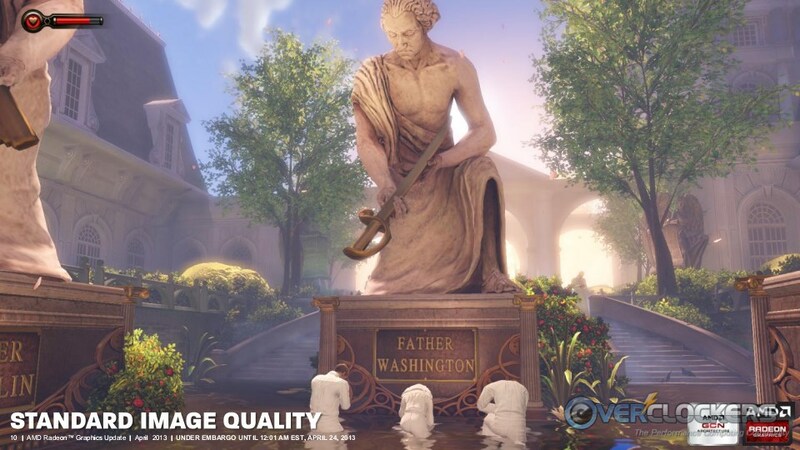 In the mean time, remember that runt frames (read our take on FCAT testing) don’t take away from your gaming experience, they just don’t necessarily add to it, which is the real problem. Fear not, they’re working on it. They just don’t want to make a firm promise on any dates without being able to hold to it. Thus, the war continues. 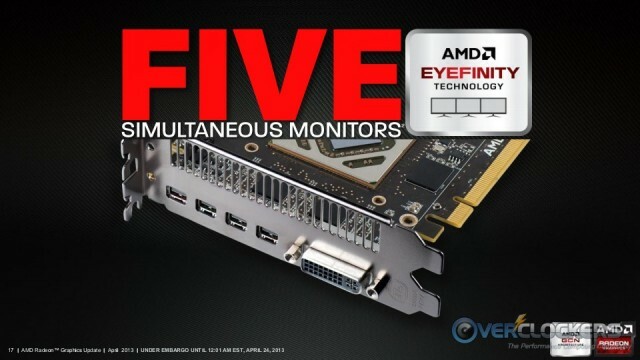 These are exciting times to be reviewing graphics cards. To wit, NVIDIA is reportedly working on more cards to flesh out their high-end price segment. While neither AMD nor NVIDIA are necessarily introducing a new generation of GPU very soon, both companies continue to work to one-up each other and drive each others’ prices down; and that’s always good news for consumers. Any info on those fans? They have a similar design to the Scythe GTs.